When others around him are hogging on chana bhatura and non-vegetarian biryani, he limits himself to the diet of peanuts and juice. And you thought just about anyone could be a hero! Well, not everyone is as lucky as Shahid Kapoor or even Ileana D'Cruz, who along with the producer Ramesh Taurani come to DT Cinemas Chandigarh for the promotion of their movie Phata Poster Nikla Hero (PPNH). Friendly greetings, a broad smile and the cast is all ready to be interrogated. Shahid is up first. The actor plays a guy mistaken for a cop in the film and seems to be at his humorous best. Wonder whether it comes naturally to him? "My friends started asking me why I wasn't doing any comedy films since they have seen me show a few award shows that had a comic script. Also Ramesh Taurani came up with the project, which I said yes to," says the actor holding on to his smile. This smile of Shahid, yes we have missed it since the actor decided to do selective films. The smile broadens, "Ramesh Taurani has been pulling me up and asking me to do more films. There was a phase when I was doing less films, but at the same time when I am coming back after a long time it better be with something good. PPNH is a great joy-ride and I have always been a fan of Rajkumar Santoshi; he has given amazing comedy films." There is a competition here; who smiles the most — Shahid or Ileana D'Cruz. The actress from the Barfi! fame is getting a tough competition. "A shift from a Barfi! kind of role to playing the bubbly kinds in PPNH was a challenge, but a conscious decision from my side. I wanted to do a full-on commercial film," shares the pretty actress who wants us to judge the chemistry between the two — on reel of course! Shahid is scared to work with his father Pankaj! "I don't know if my father wants to work with me; definitely we would love to if that kind of script comes our way," he adds. His baby face, his cute smile; for once you would forgive him any crime, in fact you would also ignore the rumours running around him about being a difficult actor to work with. "I was travelling with Shah Rukh Khan once; I asked him how he selects his films and he asked me to invest in people. I am a director's actor; I think it is the complete team that makes a film successful. I still chose my film after seeing the director, my co-actors and the producers." Shahid has shot in Punjab many a times. "I get the same hotel and room, invariably," the actor exposes his 'real' funny side. PPNH is actually seen as Shahid's comeback. "I loved working in this one thoroughly, it is such an entertaining concept… where have you actually seen a cop doing pole dance in films?" he looks back to take a good look at his movie's poster and lends us some more interesting dope. "I wanted to rehearse well before the scenes and dance sequences, but both my director and choreographer did not let me. They just wanted everything to be spontaneous and natural. So, if you find any mistake you know whom to blame," the actor shares talking about how his father loves to hear him speak Punjabi. "I would love to do a Punjabi film; this will make my father happy," the smile is now ear-to-ear. If you have Shahid in front of you, you wouldn't return without any fitness tips. "Five days of the week is functional training — I am a strict vegetarian; no eggs, healthy diet and this is about it," adds the actor who is currently living, eating and drinking Phata Poster Nikla Hero. Wait till that happens! Dance is divine for Neha Khaitan; and it was a divine coincidence that made Neha move from her profession in the IT industry and devote her soul to Bharatnatyam. 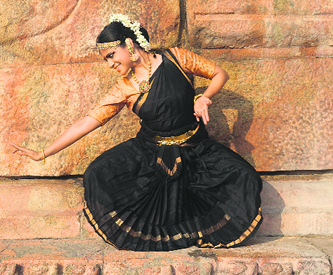 A late starter, she landed at a Bharatanatyam recital that left her mesmerised in Hyderabad. Next, she was at her Guru Hemamalini Arni's doorsteps to start a new journey. Seven years on, Neha is busy with two concerts a month around the country. "A late starter in Bharatanatyam, I still feel blessed to be where I am," says Neha, who will be in Chandigarh to give a recital for Pracheen Kala Kendra's 191st Monthly Baithak Programme on Wednesday. "The more I delved into Bharatnatyam, the more I fell in love with this beautiful classical form." Starting late, Neha had her fair share of challenges. "For any art form that requires lots of physical moves, the earlier you start the better but my passion for dance has made me get over the challenges." Who inspires Neha in her fruitful journey is her Guru Hemamalini Arni, a disciple of Padma Bhushan T Balasarwaswati for her Abhinaya and Padmasri Vazhuvoor Ramaiah Pillai for Nritta. Proud to carry forward the tradition, Neha explains her relationship with her Guru, "When we are training, while maintaining the structure of Bharatanatyam our Guru is able to bring out the best from each individual. And in order to do so, one needs to know one's disciple inside out and that's her strength. "Ask her on how she perceives the state of classical arts in the country and Neha says, "I see so many young enthusiasts taking up the old forms, but what worries me is that many centres are taking the form of business houses." Neha wants more people to take interest in classical arts and make honest efforts to provide platforms to promote and encourage young artistes. Amongst the current dancers, it's Malavika Sarukkai who inspires Neha the most. As dance requires time, hardwork, devotion; Neha is on a break from her profession. "No doubt the compensation offered by the IT industry is lucrative but dance gives me happiness and that's why I am doing it!" Mounting a theatre production equals the clichéd Herculean task; there is a set to take care of, together with sound, lighting, costumes, props and characters. In the process of channelising the energy of students, tickling the funny bone only makes things further challenging for the human faculties. Prof Mahendra Kumar believes in maintaining a balance and flits to and fro between keeping things effortless and challenging himself. “As far as comedy is concerned, I believe that one shouldn’t try to make the audience laugh. It should be an effortless process. Characters should be themselves, play the role and the audience should find that funny,” he shares of his current production The Inspector General, an adaptation of Revizor by Russian playwright Nikolai Gogol. Students of The Department of Indian Theatre, Panjab University, together put forward the play, which plays on the mistaken identity and comedy of errors. The mayor of a small town receives a secret information from the capital of the country that an Inspector General is visiting the town, incognito, to look into public affairs thereby putting all the officers in panic. Khlestacov, a man fond of high style, food and women, is mistaken for Inspector General…Finally when a letter reveals his true identity, everybody is numbed to hear the announcement. The story lends itself to twists, humour and suspense. “Each little scene has been done in such a way that it makes things challenging…There are layers to the story and each situation can have so many things lurking behind,” he shares while claiming to stay away from vulgarity, cheap tricks and thrills to make the audience laugh. “This time, the students took the initiative of going ahead with the production and therefore we have revived it.” Adapting the play to the current time and keeping things within spoken Hindi, was only a part of the preparation. “Thematically it has been done and set in today’s time but otherwise, it is a period play,” he adds. It’s been 10 weeks since his team, comprising the students, have been working towards putting the show together. “We also look at plays that require a huge cast and can accommodate maximum students,” shares the co-director Shveta. Director Ritesh Batra's debut film The Lunchbox (Dabba), starring Irrfan Khan and Nawazuddin Siddiqui, will compete in the official competition section of this year's London Film Festival. The film, that earlier won the Critics Week viewer's Choice Award at the 66th Cannes film festival, is the only Indian film to make it to the 13-film shortlist. Set in Mumbai, the film revolves around a mistaken delivery in dabbawala (lunchbox service) of Mumbai that leads to a relationship between an about to retire Sudeep, a lonely widower, and an unhappy housewife Ila as they start exchanging notes through their daily lunchbox. The film will face tough international competition from Jonathan Glazer's Under The Skin that stars Scarlett Johansson as a man-eating alien; Parkland, Peter Landesman's film about events in Dallas, Texas on the day former US President John F Kennedy was assassinated and Starred Up from British director David Mackenzie. Some of the other Indian entries in this year's line-up of 234 feature films from across 74 countries include Rituparno Ghosh's last complete feature Jeevan Smriti. The London Film Festival will host 16 international premieres and 29 European premieres. There will also be screenings of 134 live action and animated shorts. Having won rave reviews and accolades across the Globe, The Lunchbox was also recently screened at the Telluride film festival. The Lunchbox will release in India on September 20. Even the latest movie that she is producing seems to be surrounded with controversies. Ekta is producing Milan Talkies which is supposed to release some time in 2014 and is directed by Tigmanshu Dhulia. The flick will depict a love story of the modern times with the issue of film piracy as the background. Initially it was Imran Khan and Priyanka Chopra, who were the first choice for the leading roles of the movie. However, Imran was not happy about his experience of promoting the film OUATIMD and he started to speak about it to all. This made Ekta cross and she immediately replaced Imran with Shahid Kapoor. According to a close source, "Imran has gone to town talking about the nightmarish experience he had while working on the promotions of Once Upon A Time In Mumbai Dobaara. On the other hand, Ekta who is known not to take things lying down, has immediately finalised Shahid for the film. Since Sasha and PC are not exactly on the same page, it was but natural to let her go off the project." Shahid Kapoor is the ex boyfriend of Priyanka Chopra and hence it is easily understandable as why she left the project. Priyanka was not comfortable working together with her ex boyfriend. However, commenting on Priyanka's exit from Milan Talkies, Ekta Kapoor said, "Priyanka had date issues as her dates for Milan Talkies were clashing with another film. Since we changed the lead actor, the dates had to be reworked. By then, her dates were already allotted to another project. But we let her go on one condition -- that she would have to do another film with us." Chopra could not be reached to comment on her sudden exit from the film. According to the B-town grapevines, newcomer in tinsel town Shraddha Kapoor is being considered for the role that Piggy Chops left. It would be interesting to see if she gets it. 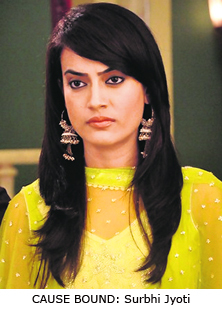 Surbhi said, "I feel scared, distressed and helpless. I feel insecure in my own country and I'm sure this is how every woman in India feels these days. My character Zoya is raising a very pertinent issue. Most men judge women by the way she dresses. Wearing skirts or stepping out late in the night doesn't make her 'available'. Men need to respect women. Why can't a woman live the way she wants to?" In the track, it will be shown how Zoya meets a stranger named Rajveer while being stranded on the roads of Bhopal because of a taxi strike. Rajveer gives her a lift back to the house. Zoya is extremely thankful but he obviously misconstrues her gratitude for her 'open-ness'. Rajveer is a typical educated but feudal minded guy who belongs to the school of thought that if a girl is friendly or she talks openly to you that means she is hitting on you or is ready to compromise. He thinks that her act of taking a lift from him makes her a morally loose girl. Actress Parineeti Chopra is ecstatic with the response to her latest film Shuddh Desi Romance and says she knew it would work ever since she read the script. Produced under the Yash Raj Films (YRF) banner, the movie that also stars Sushant Singh Rajput and Vaani Kapoor is directed by Maneesh Sharma. "When I read the script I was sure that this is going to be a very entertaining film. I was happy that Maneesh and Adi (Aditya Chopra from YRF) offered me this film because after Ishaqzaade I wanted to do something different and Shuddh Desi Romance clicked," Parineeti said. "It has released and people are liking it, the reviews are good and all the performances and Jaideep (Sahni, scriptwriter) and Maneesh's work is being appreciated. When there are a lot of messages and missed calls on your phone, you like it. So, I am very happy," added the 24-year-old. One of the main ingredients of a Prakash Jha film is its topical element and the director now wants to bring on the silver screen the relationship of the police and society today. Almost all of Jha's films be it Mrityudand, Gangaajal, Apaharan and latest Satyagraha have been connected to their time. The 61-year-old filmmaker feels the image of police in the society has changed drastically in the last 12 years and this subject could make for an interesting movie. "I did Gangaajal which was about the relationship between the society and police at that point of time. The dictum then was that society gets the police it deserves. But in the last 12 years, there has been a big change. The attitude of the society to the police is different now," Jha said. "Today if a cop has to arrest a criminal he thinks ten times, because there is the caste, communal factor, the local goon, the politician, his own officer, the judiciary. My friends, who are cops, say there is no policing in this country anymore. Efficiency has become a crime and inaction is a virtue. I find this very interesting. I have a story I could work on it," Jha said. The filmmaker, who tried his hands in politics for some time, has made his political drive well-known in his movies as well. His films have all been prisms for reflecting politics. ARIES: You can bring dreams back into focus with the added benefit of your age and wisdom. You will be in the mood to meet people from different walks of life. Tarot message: Prevent trouble by taking timely action. TAURUS: Indulging in idle talk and gossip with the neighbors will not satisfy you. Students should give plenty of time for studies. Short trips will have to be taken on a short notice. GEMINI: Someone can back-stab you, so take care. It is a very good time to meet government officials. The health of your child needs attention. You are likely to have a lot of fun at work. Tarot message: Don't reveal your plans to your competitors. CANCER: Do not become easily ruffled. Your personal and public life is likely to clash in the evening. Women: do not argue over silly matters. A desire to beautify your living space will keep you charged up. Tarot message: Feel good about yourself. LEO: You have achieved most of your short-term objectives today. It is a good day for business. Associates will be helpful. You will find the atmosphere at work congenial. Tarot message: You will encounter some financial difficulties. VIRGO: Your resources can be boosted. It is a good time to look at investment in real estate. Whatever you set your mind to you can achieve it now. Health will be good. Tarot message: Take one step at a time and avoid being over-anxious. LIBRA: Stick to your schedule. Your conscience is likely to be pricked. Don't be close-minded about anything. Instead, open your mind to new things and be surprised with your findings. Tarot message: Never fall for rash promises. SCORPIO: There is a promise of better things in the offing. It is simply up to you to take hold of opportunities and make them yours. Tarot message: Do as many courses as you can to get ahead of others. Lucky colour: Sea-green. SAGITTARIUS: Your emotions can over-ride your good judgement in some situations. Problems for factory workers are indicated. You can be misreading the actions of loved ones. Tarot message: Take things one at a time. Lucky colour: Red. CAPRICORN: It is not a favourable day for setting out on a long journey. There are likely to be delays. Old patients: take complete rest. Lovers: a romantic evening lies ahead. Tarot message: Be articulate to prevent people from coming to their own conclusions. AQUARIUS: Good company is likely today. Women: focus on a balanced diet. A pet animal needs attention. Teenage girls will be at their charming best. A Libra friend will be supportive. Tarot message: Dare to accomplish long-term tasks. Before you start breaking down walls, keep in mind all the activities that will take place in the room and if they can all be done together in harmony. Make sure you install a good chimney so that all the cooking smells don’t permeate the entire area. You will require proper ventilation ducted through the roof or exterior wall. Define your key activity areas. Make sure your sink and washing area is not easily seen by your guests in the room. Don’t ignore the decor and theme. 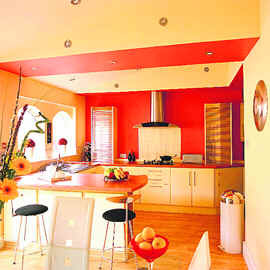 It is best to match the colours to the existing room to save costs. Light paintwork is best as it gives an illusion of openness. Key areas or the backsplash can be high-lightened by picking up colours from the room itself. Different colours can help define separate areas, so select hues in the same tone family to create a seamless flow from one space to another. Add a kitchen island as it’s the best way to add additional storage space. Try to position the eating area as close to natural light as possible. Add task lighting in your kitchen area and a pendant light over your dinner. Avoid carpets and go for more practical floorings as spillage is inevitable. The biggest mistake people make while planning for open kitchens is that they plan for aesthetics not functionality. 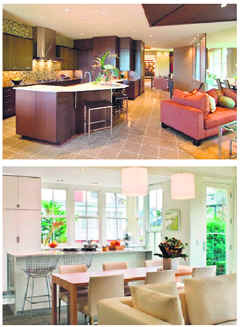 Question your lifestyle and then take the plunge to go for an open plan kitchen. If you prefer a formal dinning or rather have the staff cook for you then an open plan will be a hindrance. So choose wisely! I never follow any pre-defined style. I set my own style statements. On the whole, I prefer a classy and elegant look. It makes me feel good and I like myself. It’s a pink dress from Elle and one black dress from Guess. Currently, I’m loving wearing both of them. Whatever suits the moment! Though I prefer branded clothes as a part of the professional wear and street smart clothes for casual hanging out purposes but again it all depends on the occasion and mood. Choose one-- sporty, glamorous or chic? I like to keep things high on the glam quotient whether it is for office, party or any festive occasions. Emma Stone. I love the way she carries herself and her style. Mallika Sherawat. She needs some serious counseling on her choice of clothes and sense of dressing. None of her outfits matches the occasion. Balloon dresses. I have never understood those. Since they make one look fat, I have never liked them. I like to keep things light. A simple necklace, a bracelet or a pair of earrings could do wonders. Wearing heels and wearing anything along with a perfect pair of heels. You would love to be dressed up by…. Alexander McQueen. The designs are so wonderful that you can’t help falling in love with their clothes. At the music launch of the film, Aashiqui Not Allowed, which is a concoction of comedy, horror and romance, the actors, producers and the director speak volumes about the plot of the film and its music. “This film does not feature any Punjabi singer in it and it is a very realistic cinema. Though there is comedy in the film as it aims to garner commercial acceptance, its storyline runs smoothly in accordance with the situation,” says Rakesh Dhawan, the director of the film. The film features debutantes, Aman Sutdhar and Gurprit Kaur. “I have worked with Prakash Jha as an assistant director in the film Raajneeti and was also one of the contestants in a TV show, Lux Perfect Bride,” says Gurprit, who adds that she was advised to become an actor by Prakash Jha. In the meanwhile, Aman, who has already worked in several Punjabi music videos, says, “Rakesh and I met in Mumbai, where he promised to sign me in his film. Three years after that, he offered me the role of Bittu in this film,” he quips. Rakesh, who has also written and composed the songs of the film, has directed the music of the film too. The film features BN Sharma as Billu Bakra and Jaswant Singh of Comedy Circus and the songs have been sung by Master Saleem, Sonu Kakkar, Lamber Hussainpuri and Jawed Ali. The movie will release on September 27. For weekly draw, the lucky winner gets cash back of up to Rs 10,000 which will be announced every Sunday. For monthly draw, the lucky winner gets cash back of up to Rs. 25,000 which will be announced on September 30 and 31, Nov 30 and January 4, 2014. For movie buffs, there will be a daily draw wherein five lucky customers will be entitled to get free DT Cinemas Couple Movie Vouchers. As a Virgo and number 11, you're intelligent and conscientious, but sometimes the small details can stall you. The moon makes you a very friendly individual; simple, confident, realistic, sincere and optimistic. You are very innovative and try to perform your work in a different way. Your health will remain good throughout the year, except your backbone. So take care and start with yoga. Your financial condition remains stable this year. A new business will bring money. This year is ideal to find a partner. You will get ample support from your spouse in any critical decision you have to take. Don't worry about criticism from your relatives. Positive colours: White, Sky-blue, Pink, Light-grey, Orange and Cream. Charity on birthday: Donate green vegetables or fruits to the needy or at any religious place. You share your birthday with Tulip Joshi (born as Sanjana on September 11, Mumbai), who entered the Femina Miss India Contest in the year 2000. Mere Yaar Ki Shaadi Hai was her very first Bollywood movie. She signed for lead roles in Shoonya and Hostel. Her stars do not promise a glowing career at present. Quizzed about it, she credits her habits to her Army connection. The actress' father is a colonel in the Army and she has done her final years of schooling from Army Public School in Delhi. A mathematics graduate, Rakul has studied financial management. "They say discipline is the soul of the Army. I have grown up inculcating the values of timeliness, obedience, restraint and commitment. I'm realising that qualities like these go a long way in shaping life," Rakul avers. Rakul's family background puts the actress in a unique league of Bollywood beauties like Preity Zinta, Priyanka Chopra, Sushmita Sen, Anushka Sharma, Chitrangada Singh and Lara Dutta; all of whom hail from the military backgrounds; with parents posted in various rungs of the military hierarchy. 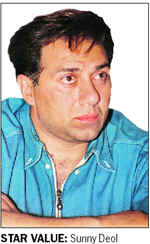 Bollywood actor Sunny Deol has been approached for a guest appearance in TV show Bachelorette India — Mere Khayalon ki Mallika. The show will see actress Mallika Sherawat's journey as she selects her partner from 30 suitors vying for her attention. Other than Sunny, no other celebrity will be coming on the show as of now, says Ajit Thakur who is the general manager of Life Ok—the channel that will air the show. "We are not looking for any more celebrities. I have met Sunny Deol and he has been approached as a guest on the show. We needed a real man on the show. You have green ones and blushing pink ones, you have soft juicy ones and you have crisp ones. But all of them are a delight to eat, one way or the other! There are even some awfully hard ones that are even called pathhar naakh! Well, don't say you weren't warned, because these are literally rock hard! Relatively cheaper, this variety is acceptable to make a chutney or hit somebody with! A pear salad with a scattering of greens and some nuts, enrobed in a tangy dressing is a lovely change from the standard kheera-tamaatar. Add some orange juice to the dressing for extra pizazz! Use an empty jam jar and blend oil, vinegar, sugar, mustard, chopped garlic, salt, and pepper. Shake well. Peel, core and cut the pears into chunks. Tear the lettuce into bite sized pieces. Chop the spring onion finely. Dice the cheese into small cubes. Break the walnuts into quarters. In a large serving bowl, layer lettuce, pears, cheese and spring onions. Pour dressing over salad, sprinkle with pecans. Toss lightly to blend and serve.